AxcessRescue specializes in needs based rope access training. We provide training to those whose work varies from low angle to complex high angle situations. We believe the level of training required should be based upon the type of work being done. Safety is the number one goal of work on rope and we strive to instill safe work and rescue practices in our students. We provide training that prepares students for SPRAT Level I, Level II, or Level III certification. 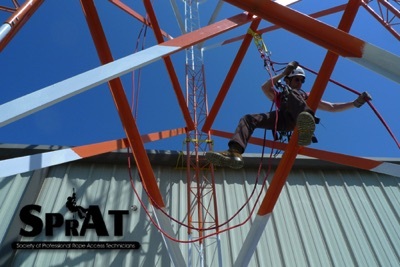 Our rope access courses are concluded with a complete SPRAT evaluation session that provides internationally recognized certification. This includes the SPRAT written, oral, and practical skills test. The cost of the SPRAT evaluation session is included in our course fees. Our east coast training center is the premier, purpose-built facilities of its kind. It provides unparalleled training opportunities that maximize student hands-on time and skill retention. AxcessRescue training is physically demanding and requires a strong level of physical fitness. You will be required to climb and descend rope for the entire duration of the class and evaluation session. Prospective attendees that exceed 210 pounds or those that have physical fitness concerns should contact us prior to course registration. Attendees must be able to, at a minimum, squat and stand without assistance 10 times. Leg strength is required to continuously climb and to perform complex rope access maneuvers. All students are encouraged to see their doctor prior to starting any of our courses. Those with cardiac conditions, obesity, surgeries within the past 12 months, or other physical impairments are responsible to see their doctor prior to attempting an AxcessRescue course. AxcessRescue is not and cannot be responsible for inability to complete a course or successfully pass an evaluation session, or for any condition arising from the exertion required to participate in a course. Course refunds due to inability to complete a course are not available. AxcessRescue is not and cannot be responsible for the failure to read this information in full. This disclaimer is not and cannot be fully inclusive of all potential reasons for attendees inability to complete a strenuous activity such as a rope access or tower climbing course. Course attendees will be required to sign a waiver of liability prior to starting the course.